– Ten summer visiting students from QLNU to CUE from July 13 to August 10 to take ENG 101 and PESS 293. 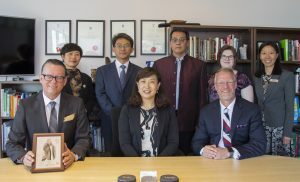 – CUE President’s visit to QLNU in November 2018. – One potential visiting teacher from QLNU to CUE in 2019. – A potential trip from the Concordia Concert Choir visiting QLNU in 2020. – Online workshops for teacher education and curriculum collaboration. Qilu Normal University is located in Ji’nan, Shandong Province, which is the hometown of Confucius. QLNU administrates the Shandong Provincial Teachers’ Training Center for Primary and Secondary Schools. For the past ten years, over 1.8 million teachers in Shandong have participated in the distance training, 98% of them passed and are satisfied with the programs. These programs have created a national record of largest scale and biggest attendance in the history of long-distance “open communication” training with the assistance of network technology, which made a great breakthrough in Shandong and Chinese education history. With the effort for years, the Center has developed an effective systematic mode of “Resources­—Service—Study—Instruction—Organization” for provincial distance-training, which has a great impact on teacher’s training nationwide. For any faculty, staff, or students who are interested in learning about QLNU and related opportunities, please contact Dr. Manfred Zeuch or Dr. Xinxin Fang for further information.